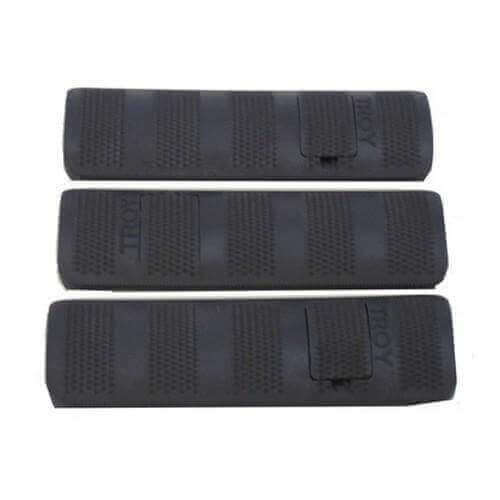 Three-pack of 4.4″ rail covers. Troy Rail Covers are engineered to survive the most extreme conditions. Constructed from durable, heat & chemical resistant synthetic polymer resin, the Troy Rail Cover quickly and easily slides onto a 1913 Picatinny Rail and locks into place with a built-in retaining clip. Scientifically engineered and proven to reduce heat transfer and abrasions to the operator’s hand. No tools required. The Troy quad rail was first choice because of the high quality, perfect fit and the detail between the rails that matches an original M4 hand guard. The rail has holes front and rear to accept quick release sling mount. The 4.4 hand guard is needed if you use that method. The other side I sometimes use a mount for flashlight so need 4.4 guard there as well. Perfect fit for a comfortable feel and great looking product. I highly recommend these guards. Troy industries products are among the finest on the market. Thank you for the feedback Richard. We're happy you're happy with the product! Good feel and nice size but way too tight when installing especially given the clip that holds it in place. Needs better sizing specs.